On an ordinary autumn day, I witnessed an interesting phenomenon. A leaf storm kicked up in front of me as I walked the nature trail in our local state park. In bustling fashion, multi-colored leaves twisted and turned. They whirled, glided, and gently swooped to earth. The movement was quick. In the aftermath, there was stillness. beautifully placed against an autumn sky. appeared to be pasted onto a fence. When I notice, there is much to see and write about. 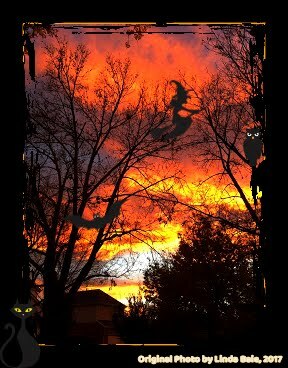 included at my #AutumnAblaze Gallery. Seeing is a gift that comes with practice. This week, I practiced the art of noticing and wondering. life and takes time to practice. Take a visual walk with me through my week. Personal and professional joyful connections were made. 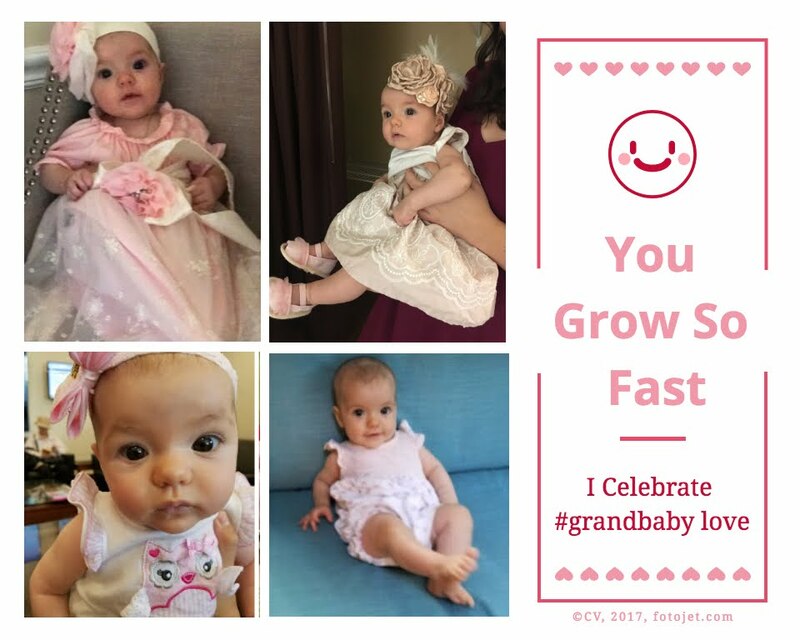 What events brought joy to your week? 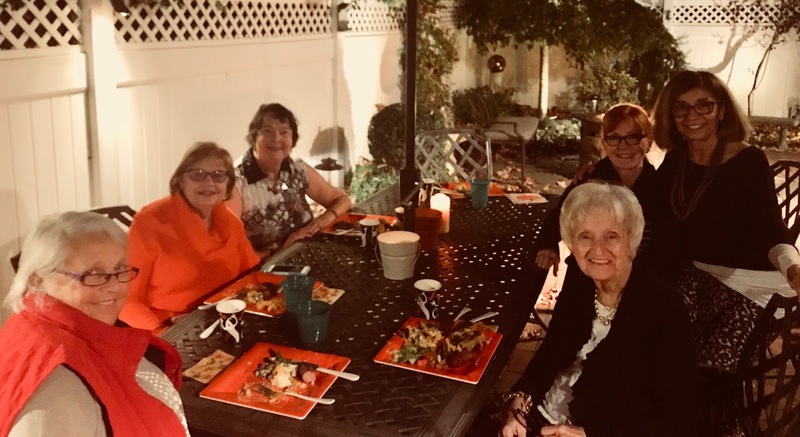 I join Ruth Ayres to Celebrate This Week! Ruth had a joyous week. Stenhouse Publishers hosted a FaceBook Live event with Ruth. 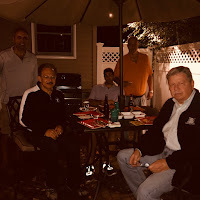 Although I could not connect that night, Stenhouse sent out the link for all to watch the presentation. You can watch it here. time with Fret and Toil. It's time to try my tasty rubble! Skull Stew, it might be! I'm off to the Poetry Friday Halloween Party at Friendly Fairy Tales. Our gracious host is Brenda Davis Harsham. This time of year, my thoughts turn to autumn. I do love this season, especially when the colorful leaves twirl and dance as the wind kicks up. We had one of those raining, wind-filled days in Long Island today. I was driving along the parkway watching the leaves parade before my eyes. If I could have stopped the car, I would have taken out my camera and notebook to reflect upon what I saw. 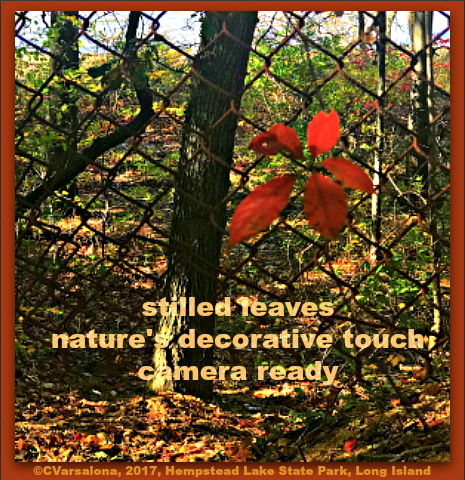 Instead, I watched in awe of nature's autumnal dance and wondered what would come next. Then, suddenly, I recalled an amazing sight from last summer when I visited my grandbaby in Virginia. That day, too, I watched in silence, transfixed on a sight. My iPhone was not near me so I could not record what I saw. I had to rely on memory. 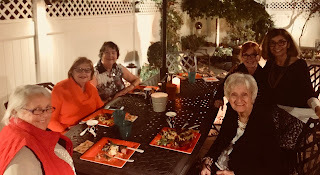 I stood quietly in awe of an uncommon backyard scene for me but an ordinary occurrence in my daughter and son-in-law's neighborhood. I captured the happening in a poem. as if they were first sightings. The above poem was sent to a Poetry Friday colleague, Buffy Silverman, for the Summer Poem Swap. 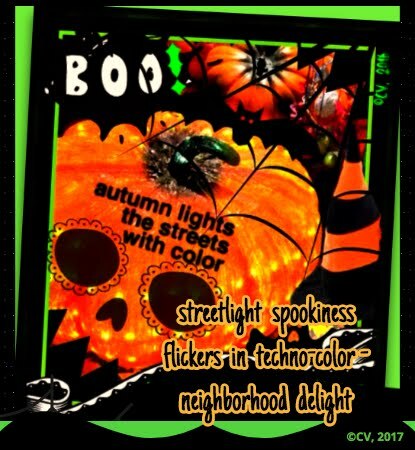 Buffy is an amazing photographer, poet, and children's writer. Her website is filled with many delights. I especially like Buffy's face page with the following thought: "Much of my writing is inspired by my curiosity about nature. I'm lucky to live near a woods and lake, where there's always something new to observe. But no matter where you live, you can discover nature right outside your door." 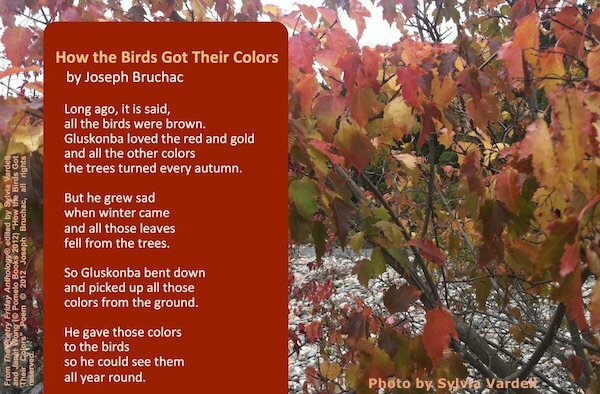 Buffy offered the following poem and digital for my fall gallery, Autumn Ablaze. 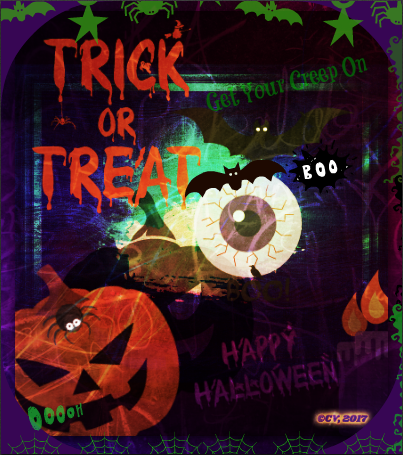 I combined Buffy's text and photo to create an #imagepoem. 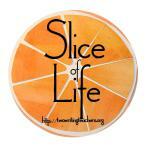 It is Slice of Life Tuesday at Two Writing Teachers so I am heading over there now to submit my writing for #sol17. Autumn in Long Island has been in slow mode so I jumped at the chance to go leaf peeping with my family yesterday. Because traffic was moving slowly, we decided that our destination would be Tarrytown and then Sleepy Hollow, one of my son's favorite places to visit. 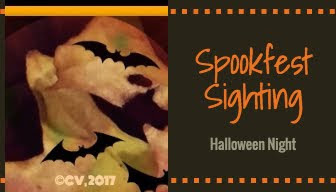 When we finally arrived, we skipped the cemetery tour and headed to sites that we thought would see the changing colors. 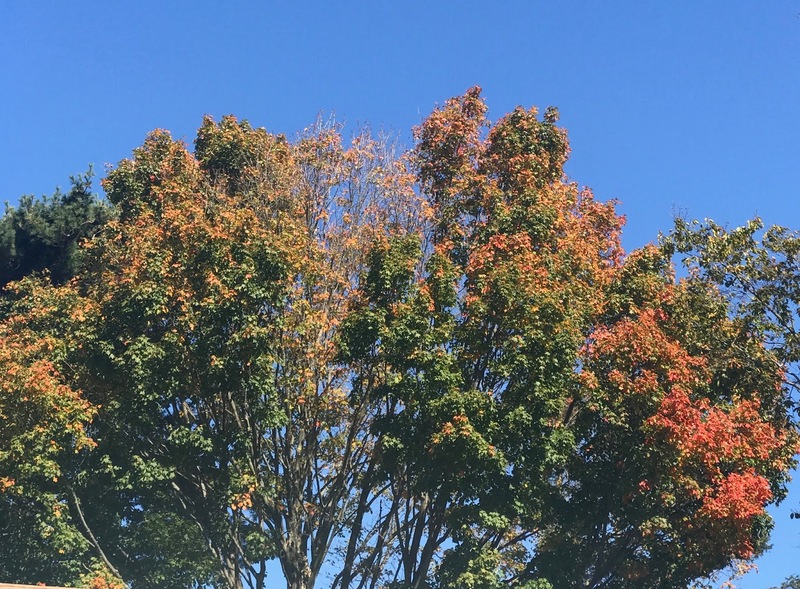 Unfortunately, the leaves were still in the transitional period. 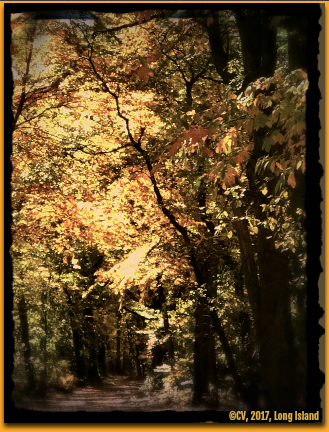 I guess the weather was still too warm to for the leaves ro turn to golden and russet hues. Realizing that we would need to travel many more hours to find a kaleidoscope of colorful leaves, we settled for a long walk around the lake at Rockefeller State Park. We not disappointed in what we saw. The lake reflected the colors of the trees just like we used to see at Mohonk Mountain House. Lost? Almost, wait-not quite yet! We followed others' clomping step. It was a relief to be on the right pathway. As leaf peeping adventures go, this one was shorter than I expected but filled with memories and photos for my upcoming global gallery, Autumn Ablaze. I celebrate leaf peeping time during the autumn season. 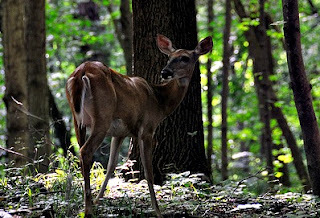 I look out my window each day, wondering what new surprise nature will provide. I slowly discover a rhythm, inspired by the tinges of autumn I see. Writing finds its way into morning. I settle in. From consciousness to paper, words appear as I reveal my inner thoughts. What starts as a glimmer of an idea becomes a messy synthesis of flowing words. 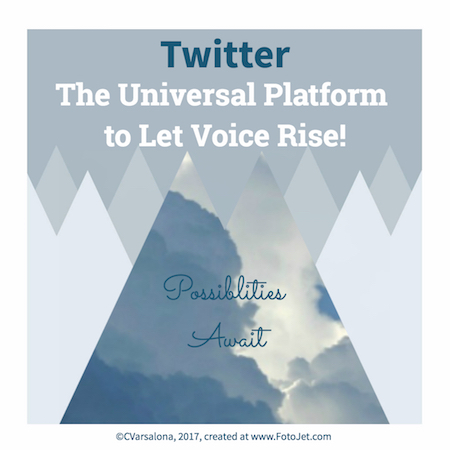 With faith and a rewrite, voice will rise on wings that fly. 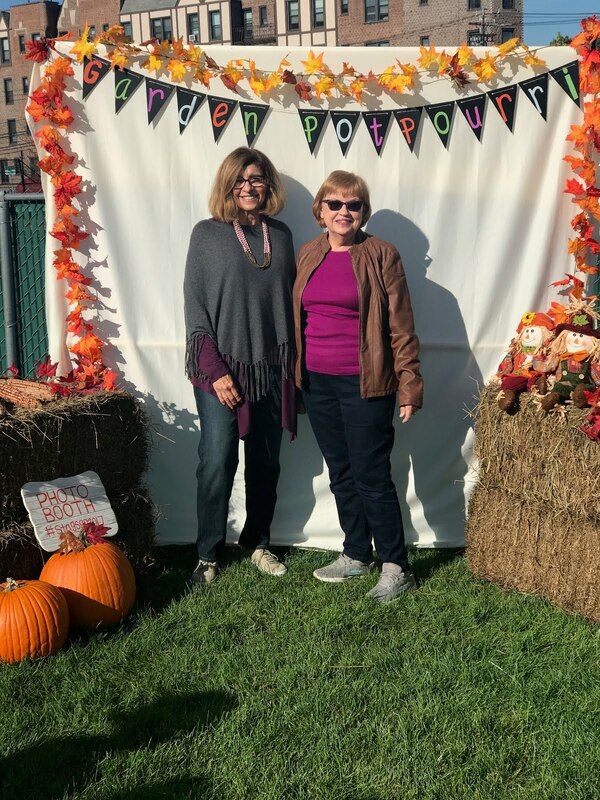 While leaf peeping is not a robust activity on Long Island this October, I seek autumnal beauty through the eyes of others. 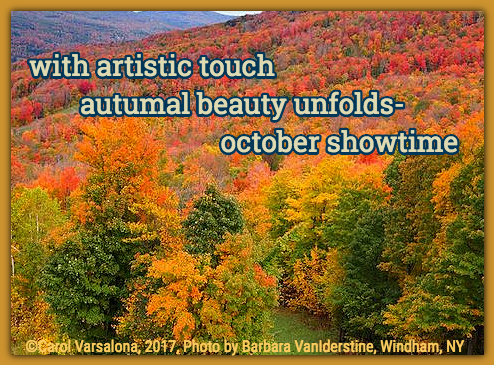 My colleague, Sylvia Vardell, captures the beauty of autumn's colors in the following image poem. 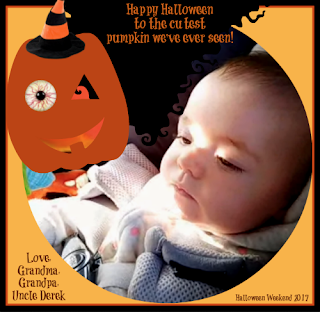 her magnificent photo of upstate New York provided me with inspiration to create a tribute to autumn. Today is the National Day On Writing. I celebrate the power of the written word through poetry. 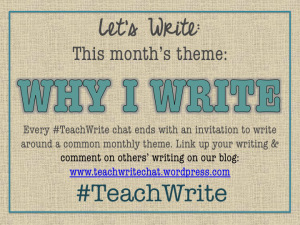 Share your thoughts on social media with the hashtag #WhyIWrite. 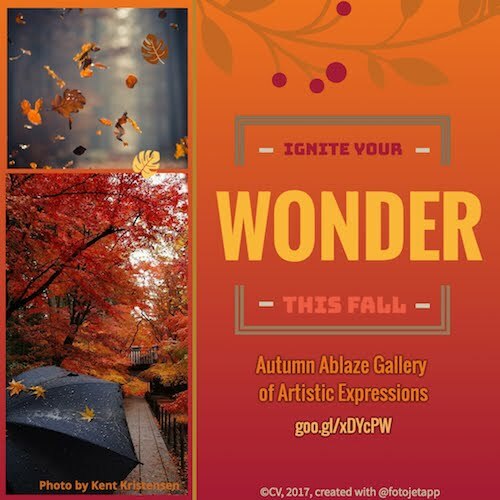 Share your digital expressions on the beauty of autumn at my upcoming gallery, #AutumnAblaze. 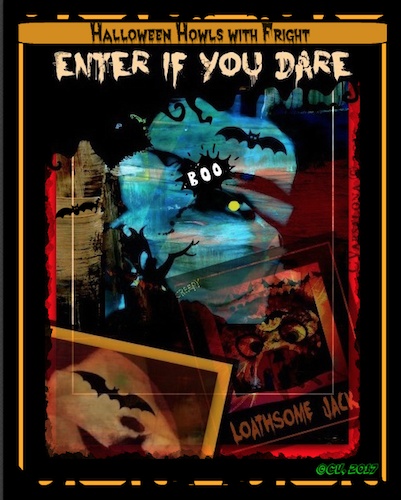 The invitation can be accessed here. 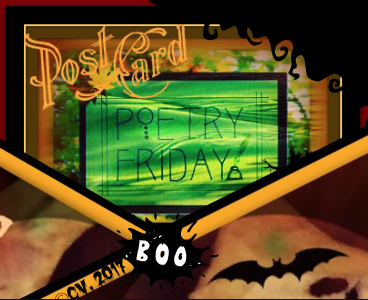 I'm off on a leaf-peeping adventure but before I go, I am checking in with others at Poetry Friday. 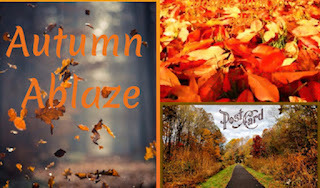 Today's Poetry Friday roundup is hosted is my writing friend, Leigh Anne Eck who offered the following for Autumn Ablaze. 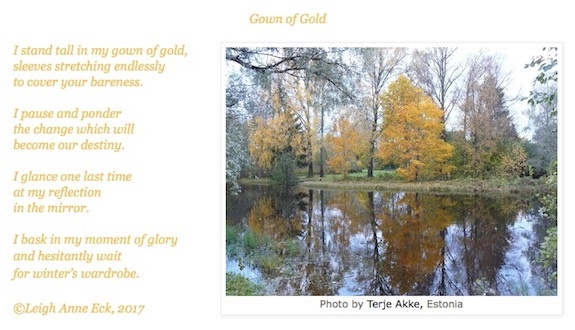 Her poem was inspired by Terje Akke's photo of autumn in Estonia. Have you heard the phrase learning is messy? How about changing that to writing is messy? In three days, NCTE will celebrate the National Day On Writing. 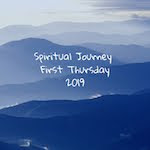 Based on a conversation with Laura Robb, I have been writing daily as part of my practice. 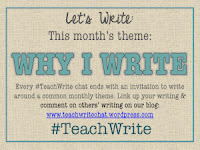 What is writing? Is it a paper full of scribbled thoughts waiting to find a home? Is it my cluttered mind urging me to release my thoughts? Despite the clutter that surrounds me, writing is my escape. It is where I dig deep, think on a different level, find a sweet spot to mine, and then excavate to uncover a golden idea. Are there bumps along the way, missteps? Of course! 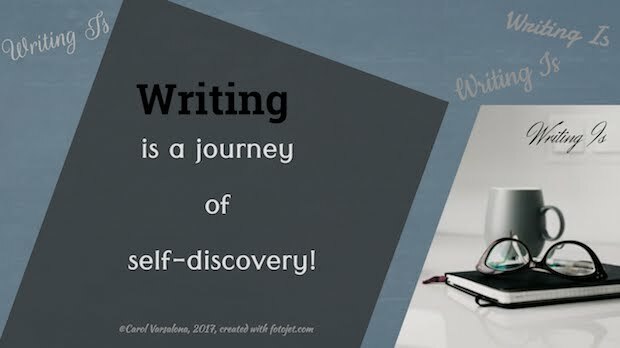 BUT for me, as a lifelong learner, writing is where I discover myself. When did writing become a passion? I started writing in a simple, marble notebook as a child. A chapter book emerged based on a favorite novel, The Bobbsey Twins. Little did I know in those childhood days that I was using mentor text as a model for my own writing. As I grew older, scattered thoughts were written in my diaries and scrapbooks. Continued writing led to high school literacy magazine submissions and the Mademoiselle Magazine contest winner. College life brought me closer to a dream: a Master's degree in creative writing. But as journeys go, life had another path. Even without that degree, writing has always been a part of my journey. 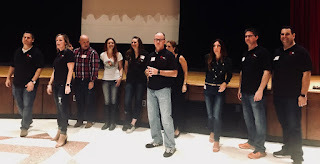 When I moved from an unconnected state to the connected world of social media, writing became my platform for change. 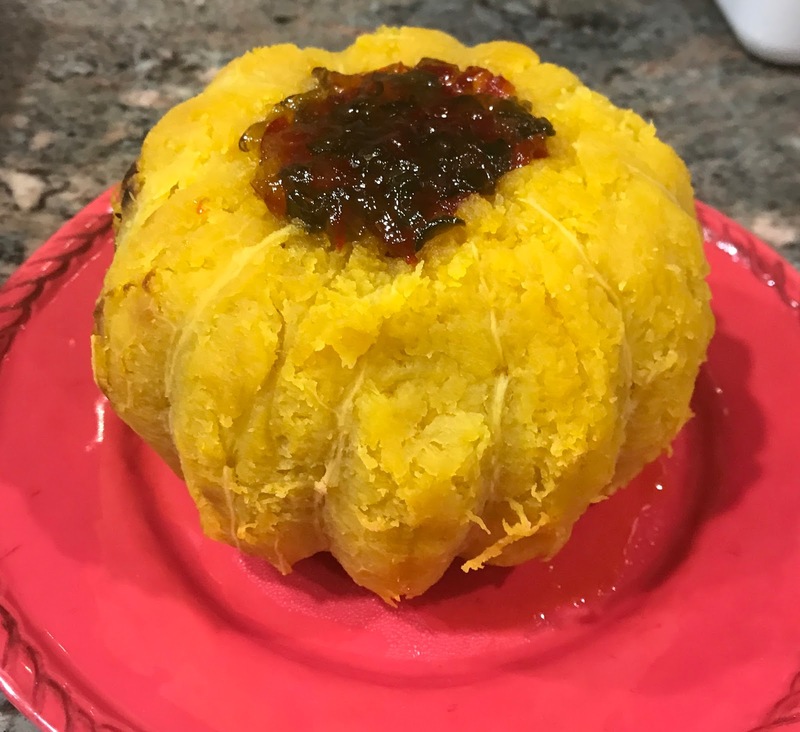 Now, in my "unretirement years", writing surfaces in the form of blogging, poetry, and the creation of global galleries of artistic expressions. I have a sanctuary for writing, a guest room with a Victorian table desk but I seem to gravitate to my office where I am writing now. There are cluttered papers strewn across this desk, scraps of thoughts, start up ideas, and crumpled notes waiting for me to organize. A few piles have turned into little mounds begging for hands to thin them out. Despite the clutter, ideas surface and percolate. Sometimes, these ideas turn into the start of poem or a blog post. Sometimes, they start as wonderings but never brew. Other times, ideas just lay in piles. Creative messiness works for me now but I still want to find the bottom of my desk. Ideas need space to breathe, to circulate, and find a landing pad. I write to release them. Understanding that voice matters, I hope to spread the joy of positivity, professional and personal wonder, and the power of written word in a connected world. I write to meet this goal but sometimes, I spend hours trying to make a thought pop, or flow in the right direction. When that doesn't happen, tension builds and a pause button is needed to free my mind so I can go back to a writing state of mind. I step away from writing when word weaving and flow are not happening. I recall one day deciding that it was time to step away from my writing world so I went to a restorative yoga class. Sitting in the stillness with all lights out allowed me time to pause, declutter my mind in a minimalist space, and be drawn into the moment. Being one with self was an awakening, a self-care step that reduced anxiety and decluttered my mind. With that fresh perspective, the trip back to the writing desk was filled with hope. Last night, the house was quiet. I sat at my desk writing a draft of this post. My thoughts of childhood brought back memories when journal writing was the start of something, a pathway. 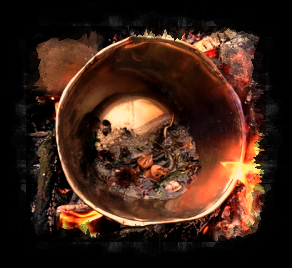 I tucked those memories and scraps of ideas into a virtual pile to be sorted in the morning. With a feeling of hope, I fell asleep thinking that writing is a great antidote for the ills of life. 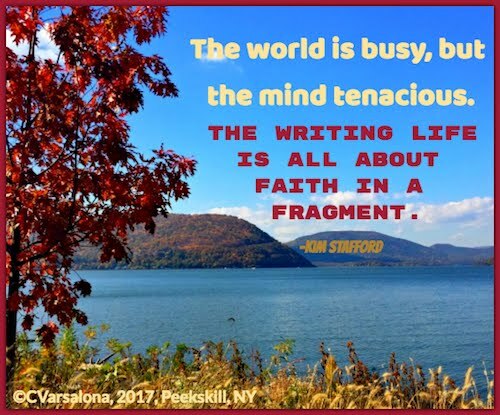 While each time I write I don't anticipate an "aha" moment, I do expect being in the zone, the place where passion meets creation. I recognize that writing is a messy process and the journey long. Knowing there is a sliver of an idea that might be the start of something promising, keeps the flame of writing burning strong for me. Tonight, I return to my writing because word weaving is my passion and revision a step closer to making the following quote from the Greek philosopher, Epictetus a reality. When I pause to notice the beauty of the world, I am inspired to wonder. This process of noticing life, ignites further wondering from which digital creations often follow. 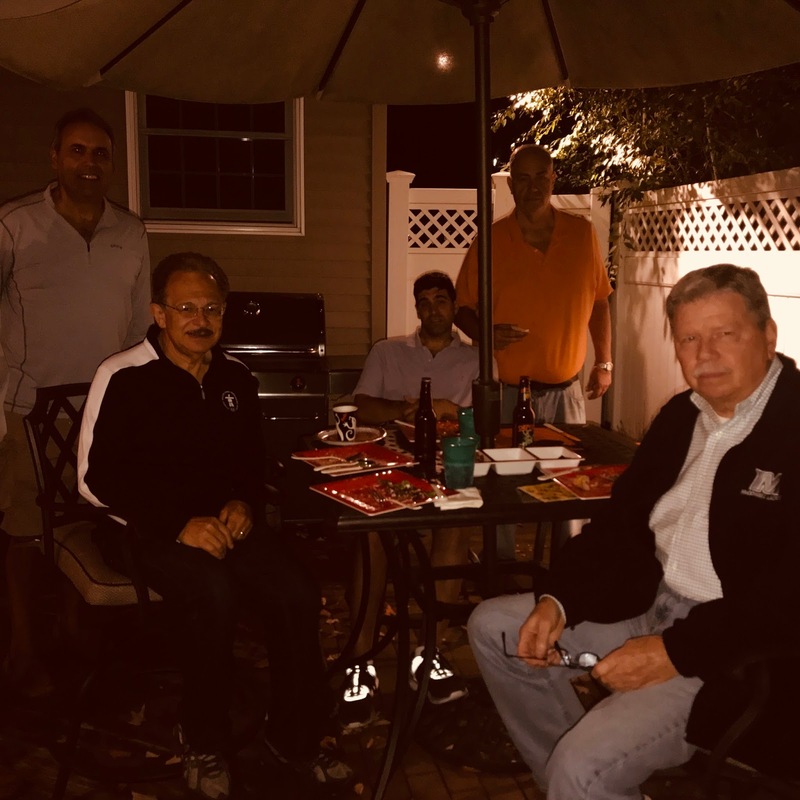 This fall, I will notice autumn's changes on Long Island to enjoy the richness of the season. 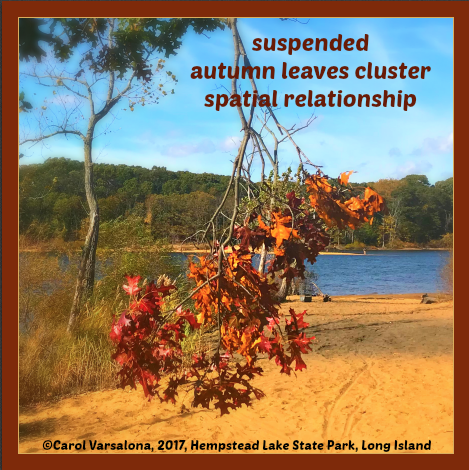 While autumn on Long Island does not yet look like what is shown below, my colleagues' photos for my upcoming gallery accumulate and cause me to reflect on what is to come. To celebrate the wonder of fall, I sent out an invitation through social media sites. I invite you to wonder alongside me this fall and create. 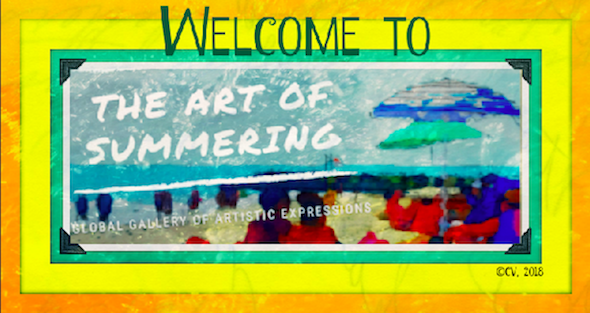 You can access the invitation to my global gallery of artistic expressions, Autumn Ablaze, here. What else has caused me to wonder professionally and personally this past week? 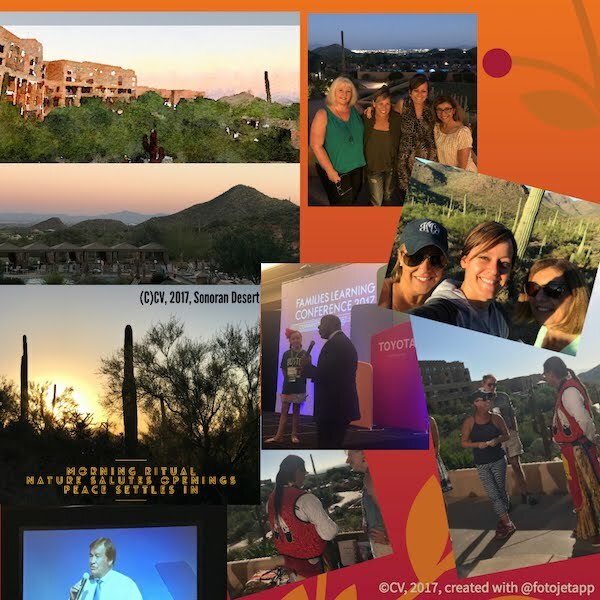 Travel to Tuscon for the National Center for Families Learning 2017 Conference-Learning was a series of "wonder-filled" moments. Inspiration flowed like water. Amazing speakers like Deborah Phelps, Billy Mays, Magic Johnson, and so many more uplifted our spirits each day as we discussed family literacy. My Wonderopolis Wonder Bunch team provided a lens to stimulate child-like wonder for all. 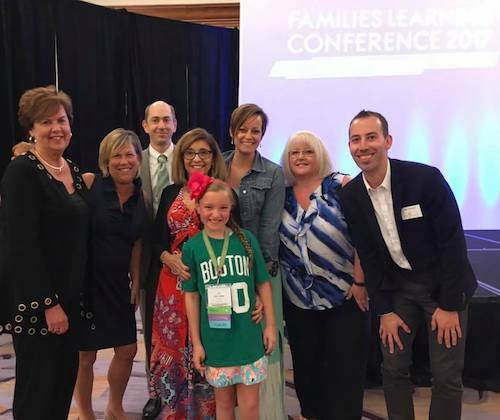 At a roundtable presentation, we showcased Wonderopolis, the free educational site where the wonders of learning never cease. Professional writing-I was asked by Evan and Laura Robb to write a guest post on The Robb Review. The post, Professional Wonder, was published on October 14th. You can access that here. I created the following #digitalsinspirations to accompany the post. 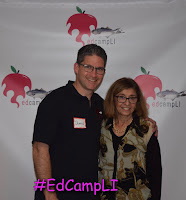 #EdCampLI-It is always a pleasure to be among a gathering of connected educators sharing the passion of learning outside of school hours. 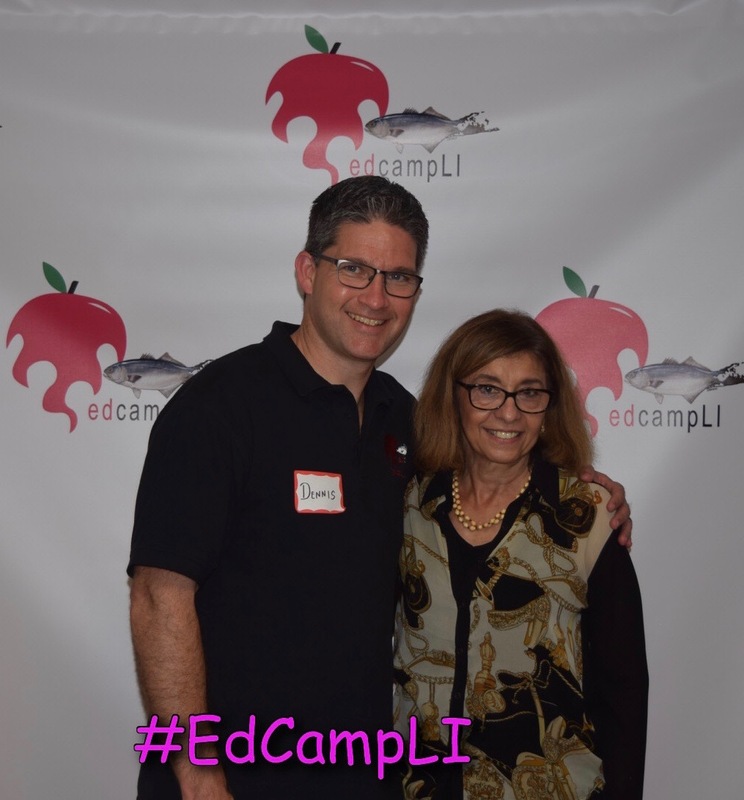 Over 800 educators on Long Island registered for this annual event. 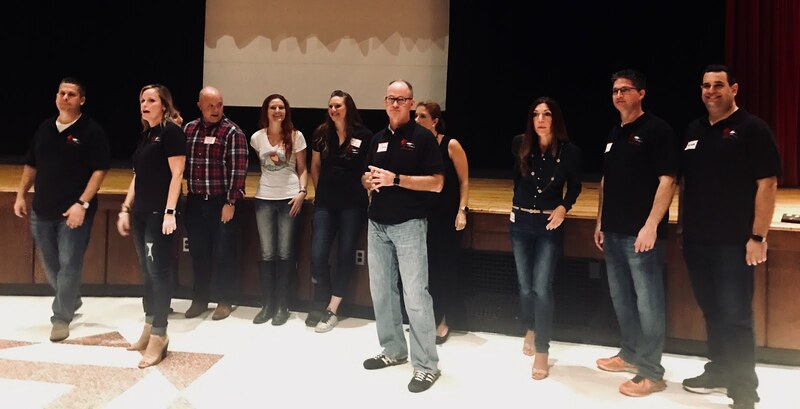 From the networking time to the sessions, conversations were filled with rich wonderings and new learnings. #grandbaby love-I am extremely happy to be a new grandmother. 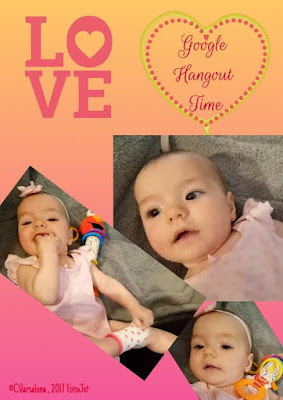 The opportunity to view photos of my grandbaby, Sierra Kathryn and/or visit with her on Google Hangout are my moments to reflect on being a grandmother. Today, was my opportunity to do so. The world is full of magical happenings. my senses with the spirit of inspired living. 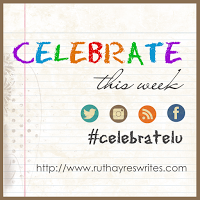 I now join Ruth Ayres at Celebrate This Week to celebrate the positives of the week with the community of writers. If you want to feel peaceful while you wonder about life, access the instrumental music via the video "Autumn Leaves" by Tim Janis here.